From the scores of wooden three-masted schooners built in the 19th and early 20th centuries for service in the West Coast lumber trade, the schooner Wawona was one of only two known to be preserved when she was surveyed in 1986. She was dismantled in 2009. 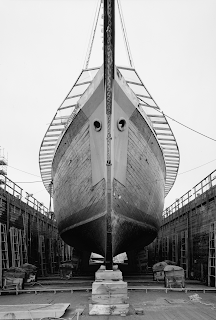 She and the one surviving lumber schooner, C.A. Thayer (National Maritime Museum, San Francisco), were built by Hans D. Bendixsen, who was well known in his time for the superior construction of his vessels. Wawona was designed for the Dolbeer & Carson Lumber Company of Eureka, California to transport more than 500,000 board feet of lumber per voyage from from the Pacific Northwest to ports further south on the coast. Like most ships in her day, Wawona’s hull was lofted from a carved wooden half model rather than a detailed set of engineering drawings. Wawona was listed on the National Register of Historic Places in 1970. Our photo gallery offers documentary photos of Wawona taken during a survey for the Historic American Engineering Record.